The only possible way a one-sided mattress can be a worthwhile consideration is if it costs half the price of a two-sided mattress. Many people are told that a one-sided mattress or no turn mattress is a benefit. We don’t believe this is the case and this article helps explain exactly what a one-sided mattress is. Above: The dreaded coil sprung mattress spring unit sometimes used with one-sided mattresses. Looking at the advertising material, it tells us that it removes the need for turning and are described as ‘easy care’. So far so good you may be thinking. In actual fact, there is simply no benefit to you but every benefit to the manufacturer. Manufacturers such as Eve, Simba and Made are all one-sided mattresses. They don’t make a big fuss about this on their websites and if you read on you will know why they don’t. In fact, we have a really detailed discussion on the new wave of boxed one-sided foam mattresses such as the Eve mattress that you can read here. What are the benefits to the manufacturer? It all started with the introduction of memory foam mattresses. People got used to not having to turn them and so manufacturers thought they could apply the same principle to all other types of mattress. Thereby, using half the normal quota of fillings and keeping their profit margins stable. The lifespan of the mattress is obviously directly halved so you will be out looking for another mattress a lot sooner than would otherwise be the case. Turning a mattress does not feature high on everyone’s list of household chores, for elderly and infirm people it can be quite a challenge. This is why I say that for these type of mattresses you should be paying proportionately less than a traditional double sided mattress not equal to and certainly not more! What are the exceptions to one-sided mattresses? There are a couple of obvious exceptions as in the case of mattresses with memory foam or latex as the comfort layer. With latex being extremely durable and expensive it will rarely be on a double-sided mattress (unless it is one complete core). Having a double-sided latex mattress (utilised on a pocket spring unit) is relatively pointless as latex is amongst the most durable product available and it will be better to replace (in time) rather than extend. These are both valid exceptions for one-sided mattresses. What if I can’t physically turn my mattress? If you really are unable to turn a mattress regularly then there are options available to you. First, you can use a double sided mattress without turning it until the sleep surface becomes unusable (not ideal – but a valid compromise) You can then turn it when the first side has become worn and you will start again sleeping on the unused side. If this was a one-sided mattress – it’s off to the shops again. Why are foam mattresses one-sided? Hybrid mattresses by their very nature can only ever be one-sided. This is down to the fact that progressive foams would be crushed beyond recognition if you turned these kinds of mattresses over. We always advise the use of a turnable topper with these kinds of mattresses to help reduce this issue. This is the drawback with the Eve mattress, Simba and Casper models. They are all one-sided so once that sleep surface settles, dips or sags that’s it. It’s game over for your new mattress. Why are some sprung mattresses one-sided? It also becomes a quality issue. No self-respecting manufacturer can claim a one-sided sprung mattress can be deemed as a quality product it isn’t. Savoir Beds, Vi-Spring and manufacturers of that ilk would not dream of producing a mattress that has upholstery on one side and not much at all on the other. It goes against everything they stand for. The manufacturing process of one-sided mattresses also goes towards a logical explanation of why a one-sided coil sprung mattress can be seen as completely inferior. On one-sided mattresses, there is a sleep surface and an underlying non-sleep surface. Nine times out of ten this non-sleep surface will be nothing more than a saturn pad (The recycled grey material you may be familiar with) clipped to the spring unit. This will be all that is keeping the spring unit stable and preventing the springs from penetrating through the underside fabric. I regularly see comments on the web that state non-turn mattresses utilise ‘new materials’ and springing systems in order that the mattress won’t suffer from the same settlement problems as other forms of construction may this is obviously nothing short of complete diatribe. 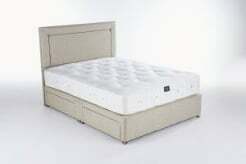 There are only so many upholstery components that can be used in a mattress and I have not seen or heard of any component that is more durable than those currently used. If there were, do you not think that manufacturers would be using them on all their mattresses to ensure a greater degree of longevity? A double-sided mattress is far superior in all ways than a single-sided non-turn mattress. Obviously you won’t be getting a quality product with a one-sided sprung mattress despite how good some advertising is, and of course, your purchasing decision should take into account the asking price. Latex and hybrid foam being the exception. There are plenty of examples online of a two-sided mattress being cheaper than a lower quality one-sided mattress. If you have read our post know your GSM times table you will understand what is also so blatantly lacking in this description. If you haven’t read it yet, then do so, it will save you a fortune! What is also missing from this extremely limited description is any kind of notification as to whether this particular mattress is one-sided or two-sided. If a consumer was completely unaware of the pitfalls of the one-sided design manufacture they would not even notice this blatant omission until it was too late. All of the below are one-sided mattress models as examples of how widespread one-sided mattresses are! In some cases this is because they are made of foam, however, we always recommend that these models need a turnable two-sided topper to mitigate against this. It is worthwhile noting whether the new mattress you are looking for is one-sided and double check that for the money there isn’t another more suitable alternative. As you read through this site you will see that the general theme is not to take things at face value. You really must question what you are being told. There is a good indicator to watch out for, though. If a mattress manufacturer is proud of the product they are offering up for sale, there will be reams and reams of descriptive information given informing you of such. To complete a purchase, based on the scant information as offered in the above example, means you’re purchasing a product without knowing exactly what you’re buying.